"A gripping account of how decent people can be taken in by a charismatic and crazed tyrant" (The New York Times Book Review). In 1954, a past or named Jim Jones opened a church in Indianapolis called Peoples Temple Full Gospel Church. He was a charismatic preacher with idealistic beliefs, and he quickly filled his pews with an audience eager to hear his sermons on social justice. As Jones's behavior became erratic and his message more ominous, his followers leaned on each other to recapture the sense of equality that had drawn them to his church. But even as the congregation thrived, Jones made it increasingly difficult for members to leave. By the time Jones moved his congregation to a remote jungle in Guyana and the U.S. government began to investigate allegations of abuse and false imprisonment in Jonestown, it was too late. 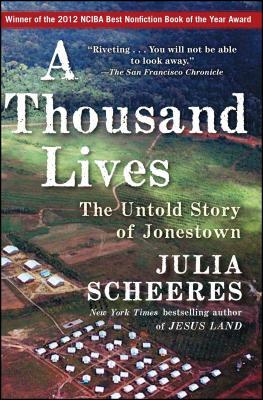 A Thousand Lives is the story of Jonestown as it has never been told. New York Times bestselling author Julia Scheeres drew from tens of thousands of recently declassified FBI documents and audiotapes, as well as rare videos and interviews, to piece together an unprecedented and compelling history of the doomed camp, focusing on the people who lived there. The people who built Jonestown wanted to forge a better life for themselves and their children. In South America, however, they found themselves trapped in Jonestown and cut off from the outside world as their leader goaded them toward committing "revolutionary suicide" and deprived them of food, sleep, and hope. Vividly written and impossible to forget, A Thousand Lives is a story of blind loyalty and daring escapes, of corrupted ideals and senseless, haunting loss. Julia Scheeres is the author of New York Times bestselling memoir Jesus Land. She lives in Berkeley, California with her husband and two daughters.